Small, but powerful! The smallish Pixel 2 smartphone features a 5-inch 16:9 display. In addition to being slightly cheaper, this is the only difference when compared with its bigger brother. The camera has managed to impress us but battery life is a little on the short side. Google's promised three years of software updates and security patches for the phone, meaning it's guaranteed to get the Android R update when it lands in 2020. That's a big deal in the Android space, and it makes the Pixel 2 a lot more appealing if you're considering picking it up a year into its life cycle. A great phone, but its time in the sun is drawing to a close. We’ve updated this review to reflect how the Pixel 2 compares to current generation phones and has survived long-term use. These include updates detailing how it stacks up to key rivals, like the Galaxy S9, iPhone X and OnePlus 6. The Pixel 2 is compact, runs the best version of Android and has a stunning, class-leading camera. If only it looked slightly more modern then it would be the perfect small phone. I hate the bezels. I really HATE them. But I love everything else about this immensely powerful, super-useful phone. Given the choice, I would always go with the Pixel 2 XL, but if you want something smaller with a brighter display, then the Pixel 2 is about as good as it gets. The Google Pixel 2 combines hardware with powerful software to produce incredibly detailed and vibrant still images in both daylight and low light. Class-leading dual pixel AF is fast and accurate even in low light, and 4K/30p is both beautiful and also smooth thanks to optical + electronic stabilization. The camera's background blurring mode is among the best. And unlimited free photo storage via Google Photo is just the icing on the cake. We wish it offered wireless charging, a more accurate color display and a telephoto rear camera. But still you'd be hard put to find a smartphone in 2018 that takes prettier pictures. Last year's Pixels were fantastic. Perhaps the first time in years that Google's "pure" line of phones had no compromises. Great screens, great build, amazing cameras, good battery life and pure Android in one proper flagship package. This year, that's not the case. Unfortunately, a few new problems have wormed their way in. As a result, the Pixel 2 range is solid, but not award-winning – and that’s a real shame. The Google Pixel 2 is packed with some amazing internals in a humdrum design. Comparing to its predecessor, it has a speedy processor, improved camera modules, and offers outstanding Android experience. If you don’t mind the big bezels, the Pixel 2 can easily satiate your hunger for power. If you need smaller bezels and can spend more, go for the Pixel 2 XL, which is not much different except for the display and the battery, but it all boils down to the display size and your convenience. Even though it starts at Rs. 61,000, Flipkart is coming up with several offers, which brings down the price of the phone to Rs. 39,999. We can all quibble about the value proposition of the larger Pixel 2 XL at $849, with a larger screen and battery not quite justifying the $200 price bump. But when you look at what the Pixel 2 offers for just $649 it's no surprise that I and the rest of the Android Central team rate it so highly. And an extra month of use has only solidified my feelings on this great phone. Even taking its imperfections into account, it's the best phone Google has made and one I think anyone would be happy using. After testing both phones, it’s clear that the Pixel 2 is the safer choice of the two. Sure, you lose out on a bit of screen real estate and aesthetics, but in turn, you get a better quality display which lacks most of the (sometimes) deal-breaking issues of the Pixel 2 XL. Other than that, you get the same performance, the same great cameras, and the promise of timely updates from Google. If you’re looking for a higher resolution display and advanced features like wireless charging in the Android space, then look no further than the Samsung Galaxy S8. The iPhone 8 is also an excellent alternative to the Pixel 2, which retails around the same price as the Pixel 2. Now the Pixel 2 isn’t a perfect handset. The bezels around the display are enormous for a phone in 2017, and the build quality, while still quite nice in general, doesn’t match the same quality of the Pixel 2 XL. But in all honesty, while we’d all prefer a sexier phone with smaller bezels, after a week of using the Pixel 2, you just forget it’s an issue altogether. A well-performing phone with an excellent camera and pure Android experience, and its screen is better than its big brother’s. Is the small Pixel 2 the better Pixel this year? Certainly not if you're looking for a large display. Put that aside, however, and the Pixel 2 delivers the goods just as well as its XL counterpart while being considerably more affordable, not to mention you can actually buy one right now. Add to that the glaring lack of reported display issues on the Pixel 2 M, in stark contrast to the rocky launch of the Extra Large version, and it could mean that small is the way to go. 90% Google Pixel 2 Review: Is This The Best Smartphone Ever? The screen on the XL and the bezels on the standard Pixel 2 are obvious missteps, and the lack of a 3.5mm jack will upset some, but in my opinion these aren't big concerns. 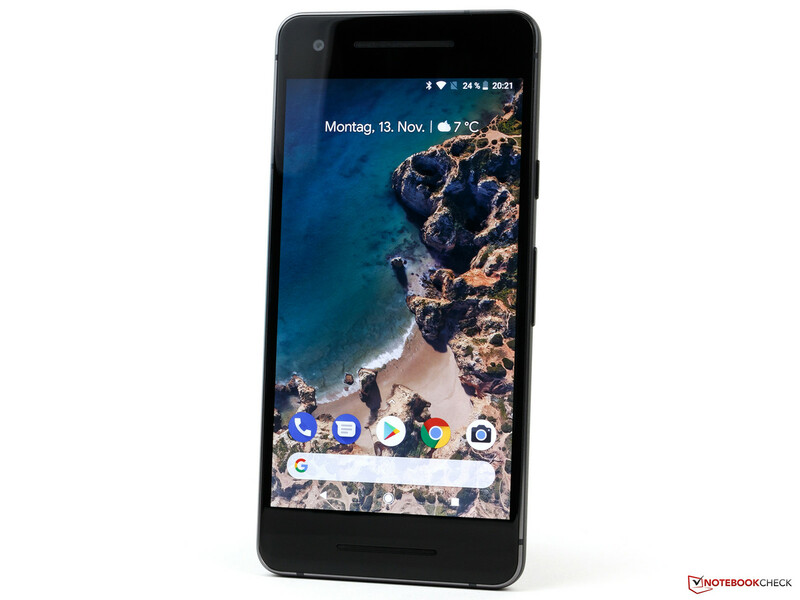 These phones set out to improve everything that was already great about the original Pixel, and to bring the same excellent custom touch to Android O that last year's phone brough to Android N, and that's exactly what they do. The Pixel 2 clues us in on why Google called its phone series Pixel: it was building the best camera on a phone. This second-generation effort fulfills that promise with best-in-class photos, dual front-facing speakers and water-resistance. You'll just need to be okay with the fact that it looks dated and there’s no headphone jack. The Pixel 2 stormed out of the gate without compromise. The Samsung AMOLED panel is simply outstanding and the specs aren’t lessened in any meaningful way, so the experience is identical to its big brother. There are rumblings out there about clicks and noises coming from some Pixel 2 units, but I haven’t experienced any of that. As far as I’m concerned, the Pixel 2 is Google’s Android 8.0 Oreo champion. The unlikely king of the mountain this year. The Pixel 2 isn’t a flashy phone. If you’re looking for something to impress your friends who are getting an iPhone X, you’ll have to look at the Galaxy phones. However, if software and camera is your game like it is for me, or if you need an all-around reliable phone that doesn’t have any serious deficiencies, the Pixel 2 will make you very happy. When you throw in the size and price point, I feel confident giving the Pixel 2 a big recommendation for a large group of smartphone users out there. The Pixel 2 is available now direct from Google for $649 with 64 GB of storage, and $749 with 128 GB of storage. You can pick from black, white, blue, and a black-and-white combination as your color. Google Pixel 2 Review: Compact and Concise, but Who’s It For? The big question though is who’s going to buy the Pixel 2 – it’s a natural upgrade for the 2015 Nexus 5X, while 6P owners will head for the Pixel 2 XL, matching size for size. Anyone with last year’s Pixel or Pixel XL is likely to want to stay put though – keeping the headphone jack and saving a lot of money in the process. Buy the Pixel 2 for the best camera on any Android phone and fast Google updates, but skip it if you can't live without a headphone jack or a standout design. Last year's Pixels were fantastic. Perhaps the first time in years that Google's "pure" line of phones had no compromises. Great screens, great build, amazing cameras, good battery life and pure Android in one proper flagship package. This year, it's a similar story, although there's not a huge amount of improvement. The Pixel 2 is a boring phone until you turn it on. The uninspiring hardware melts away to present you with a bleeding edge vision of the Android future, with machine learning fully integrated. It’s not quite there yet, but this is where we are heading. 80% Google Pixel 2 Review: Best Android ever? Google’s Pixel phones are among the very few Android handsets out there to offer a clean, unfettered version of the OS, packed inside some premium hardware. You might not get much in the way of frills, yet the Pixel is a well-constructed smartphone that delivers dependable performance and solid battery life, as well as one of the better cameras of 2017. It’s also pleasingly compact, compared with the slew of 5.5-inch-plus mobiles out there. The Pixel 2 clues us in on why Google called its phone series Pixel: it was building the best camera on a phone. This second-generation effort fulfills that promise with best-in-class photos, dual front-facing speakers and water-resistance. You have to be okay that it looks dated and there’s no headphone jack. If you want the latest and greatest, definitely give the Pixel 2 and Pixel 2 XL a shot, but if you’ve got the original Pixel or Pixel XL and are happy with it, you may as well stick with that for now. Of Google’s two phones, I lean toward the Pixel 2 XL. Its screen may not be the finest, but the extra size and much smaller bezels compared to the Pixel 2 make it a more rewarding everyday device. If your online life is on Google’s servers, and you prize camera talents above all else, the Pixel 2 is the best combination of that. Just be sure you can live without wireless charging and a headphone jack in the process. There’s a lot to love about the Google Pixel 2. It’s a way better phone than the original Pixel, with a far more coherent design, a better screen and even better camera. On the Pixel 2, however, you can currently only use Active Edge to launch Google Assistant. It’s a frustrating limitation, because the squeeze functionality has the potential to solve common issues. If Google removes these shackles, this negative will become a big plus point. In a vacuum the Pixel 2 is a great Android smartphone, with a vibrant display, and a solid construction with innovative squeezable edges. However, in the face of stiff competition from Samsung, LG and OnePlus, the Pixel 2 looks outdated, with only its excellent camera and lovely Android experience making it noteworthy. 80% Google Pixel 2 review: Can Google finally beat the iPhone? Google has again proved it can make a great phone. With a growing ecosystem and powerful machine learning, Google is molding its mobile lineup into something very special. Now, the search giant needs to figure out how to convince existing iPhone and Galaxy owners to make the switch. While all eyes will most certainly – and probably rightfully – be on the Google Pixel 2 XL, its smaller sibling still seems to offer a strong upgrade. Google has followed up its debut phone with a device that is both polished and powerful. Combining top-class software and formidable hardware, the Pixel 2 is a flagship to rival the likes of the latest iPhone or Galaxy models. Our first impressions of the Pixel 2 are mixed. We loved the original and although the new model brings the best of Google via Android Oreo, we're not sure enough has changed to warrant a higher price and to compete with rivals. The phone is missing key features including wireless charging, a microSD card slot and an exciting display. The Pixel 2 XL is a lot more interesting. We’re in danger of running out of superlatives when describing the major image quality attributes of the Google Pixel 2. That makes sense for a device that tops our scoring charts —up from the 94 of the Apple iPhone 8 Plus and Samsung Galaxy Note 8 to a record-setting 98. So for just about any Photo or Video use case, it recommends itself as the phone camera with the best image quality. A notable exception to that assessment centers around the added performance in Zoom and Bokeh (including Depth and Portrait) that dual-camera smartphones such as the Apple iPhone 8 Plus and Galaxy Note 8 can provide. This said, the Pixel 2 is especially well-suited to videographers, as it achieves the highest Video score for any device we’ve tested — a 96. Yes and no. The Pixel 2 is a great smartphone. In fact, it's the best Android smartphone in the market right now. Especially for someone looking for a compact smartphone. But, it isn't meant for everybody. The Pixel 2 is meant for people looking for a no nonsense Android smartphone that works, and has an outstanding camera while at it. For everybody else, there are certainly flashier options in the market that can do so much more. Positive: Top performance; excellent cameras. Positive: Large screen; impressive design; powerful hardware; nice display; long battery life; quick charging; top cameras. Positive: Nice design; high performance; top cameras. Positive: Excellent cameras; high performance; premium design. Positive: Nice display; impressive design; excellent cameras; long battery life. Positive: Excellent cameras; high performance; support waterproof; nice design. Negative: No memory card slot; no headphone jack. Positive: Excellent cameras; top hardware; nice performance; premium design. Negative: High price. Positive: Top cameras; high performance; support waterproof; excellent display; fast system; flexible fingerprint sensor; good speakers. Negative: Large frames; relatively high price; no headphone jack; no wireless charging; no memory card slot. 86% مراجعة للهاتف Google Pixel 2:أفضل هاتف صغير الحجم! Model: The Google Pixel 2 has the best camera quality of any Android phone, and updates like water resistance and a best-in-class processor make it a top pick. The Android Oreo software will get regular updates, and Google's Lens feature taps into Google's vast search database so the user can immediately learn more about the world. Even though it’s constructed from aluminum, the back has a story-like finish. It is harsh and textured; strange at first but ultimately, super-nice. It is far grippier in the hand than shiny aluminum and isn’t as slippery when sat on a table the same way a glass back is. Neither does it appear to pick up fingerprints. Like the previous Pixel, there is a glass ‘shade’ just above the metal covering the camera sensor and flash. Aside from adding contrast to the metal, this is where all the cellular and Wi-Fi antennas live. Giving them plenty of space should help connectivity, but it also means there are no antenna bands elsewhere. Hopefully, this glass panel will be less prone to scratching. Like most flagship phones this year, the Pixel 2 is IP67-rated for water-resistance. Another, less desirable, trend Google has decided to follow is the removal of the headphone jack. The user gets a USB-C to 3.5 mm port dongle in the box and there are plenty of ‘Made for Google’ USB-C headphones coming soon. There is not a whole lot to get excited about with regards to the Pixel 2’s screen. As in the first iteration of the device, it is a 5-inch, 1080p AMOLED panel that looks good but is far short of stunning. AMOLED panels are renowned for offering more saturated colors, perfect blacks and better contrast over their LCD counterparts. The panel on the Pixel 2 edges towards the warm side, so the user will likely find that whites will have a slightly orange tinge. Note that Google does not offer any capability to adjust colors on the display, which is annoying if the user prefers a slightly cooler screen. The Pixel 2 does not quite have the huge performance shift of its predecessor, probably because it uses the same Snapdragon 835 platform and 4 GB of RAM as the majority of other 2017 flagships. Nevertheless, it remains speedy in almost every single area. The single biggest reason to choose the Pixel 2 over any other handset is the camera. On paper, the 12-megapixel f/1.8 unit sounds pedestrian. In use however, it captures some wonderfully detailed images that are often much better than those produced by the competition. Video capture is excellent. The camera now uses both EIS (electronic image stabilization) and OIS (optical image stabilization) to help avoid shakiness, resulting in a smoother image. 83.82%: This rating should be considered to be average. This is because the proportion of notebooks which have a higher rating is approximately equal to the proportion which have a lower rating.